I’m sorry this has taken so long! Do we all remember when Kurt gave Rachel her first makeover? Nice to see that this one went better (and had better intentions). I don’t suppose it will surprise anyone to find out I was most interested in Blaine’s makeover. Because Blaine thought he was the one doing the makeover. And sure, he put a suit and tie on Sam (who still ended up stripping instead of debating) but mostly, Sam told him what Santana kept telling him in Season 3 — the bowtie is weird. And seriously? Isn’t it? Kurt was the only bowtied character before Blaine started at McKinley. There was some brief speculation last year that Blaine’s bowties were indicative of the Kurt and Blaine relationship. Well, it looks as though that may still be true. Blaine is also finally being honest about transferring to McKinley entirely for Kurt (or is he just blaming Kurt now?). And maybe — was the Kurt-esque bowtie the clue? Because this time, when Blaine needs Kurt to show he cares, and choose the symbol, Kurt is too distracted. And when someone tells him what he’s probably always known — that the bowtie is weird, he takes it off. He seems surprised that it didn’t hurt. I think we’re all pretty sure Rachel’s makeover will stick, but will Blaine’s? The stills we’ve seen from the next episode show him in two outfits without a bowtie. Also, about Blaine — we had two comments about his racial identity. There’s no way Brittany demanding proof that Blaine was born in this country was not a reference to being mixed race. A later comment about Filipinos didn’t feel accidental either. I’m being hopeful here, but I really think this is a reminder that Blaine isn’t being whitewashed. Along with the race of “baby Blaine” and the information that he was meant to have been played by the mini Warbler at first, I think this is all looking pretty good. Although as Biyuti points out, Blaine being a PoC may mean that his storyline will always be somewhat limited. There was little limited about Blaine’s activities in this episode though — from Roblaine to the magical guy in D&D (please tell me there are some D&D nerds out there who can talk about this better) and fighting zombies. And the fighting the dead thing was interesting, because of how Blaine ushered Kurt to the afterlife (heaven, anyway) in “It’s Time”. 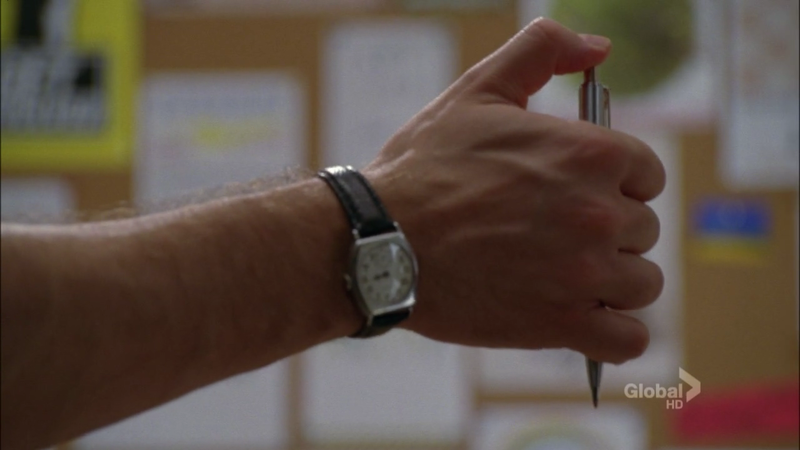 Speaking of time, we had a closeup of Blaine’s watch, and then Kurt was wearing a pocket watch around his neck, which harkens us back a little to the day the two boys met, when Blaine was checking to see if it was time to fall in love. Sam’s makeover is unlikely to stick. His budding intimacy with Brittany, however? Sticky. Brittany’s makeover will last as long as her Rachel-clothes fad. Rachel’s makeover will stick, and I’m not even all that curious about Finn vs Brody, though I think I like Brody better. Kurt does not have a make over — in fact, I got to add a new photo to the Kurt’s Tail post. Brittany throwing the election took me by surprise — in fact, I think it took me a few minutes to realise she’d done it on purpose — and why. Brett is my spirit animal. Isabelle is set to be all kinds of fun. The props and costume department are going to town on her desk and her wardrobe. A single cup (still waiting on that Tarot post! ), calla lillies, peonies, dragon fruit, phoenix necklace. I need more Rachel and Cassandra in my life. Is that too much to ask? I love the ironies you point out regarding Blaine making over Sam . . . and the makeover (which maybe isn’t done yet) Blaine ends up with. I like his reaction to following Sam’s advice. He’s so certain that it’s bunk, and scoffs at the advice. In some ways, he does that with plenty of others besides Kurt, doesn’t he? Like the way he reacts to Brittany not liking his hair in the prom episode. I can’t help but think of the Cooper comment about Blaine’s wardrobe, too, that Kurt was picking out his clothes—even though mini-Blaine had a bowtie, didn’t he? But still, I’m rooting for Blaine figuring out who he really is this season, given that he’s been with Kurt so long that there’s a kind of dependence there. Really loving Cassandra. I like that she’s just so . . . nice. I hadn’t really thought about Brittany purposely throwing the election–I want to watch that again. She’s sly and I’m enjoying her screen time SO much so far this season. Yeah, watch that bit again. Especially the things Blaine says immediately before Brittany starts talking about everyone going to school at weekends. And yeah, Brittany has really popped this season for me, where she was always just comedy before. And you’re right: Blaine’s makeover has just begun (and it’s a positive one). I’m wondering will Kurt have one too. It’s funny–when Brittany first starts talking about how she loves the school, I thought (when the ep aired), “Blaine’s going to lose.” Because she really does love it, and you can feel that, and Blaine’s speech was pretty empty in comparison–he doesn’t feel that way about the school. Then Brittany’s speech shifts entirely into new territory . . . and that’s what causes everyone to start walking out. She’s sly. Ironic, too, that Blaine originally tells Brit that the election is about ideas, and that it’s not a popularity contest. But in the end he really has no ideas, and Sam’s the likely reason they won (with Brit’s help). I would assume Kurt would change too, somehow, and grow. But I don’t know–I’d posted elsewhere that he doesn’t have to fit in with his new surroundings like Rachel does (and arguably, Blaine). He finally found an environment he fits into perfectly. And rather than needing one, he’s the orchestrator of makeovers–for both Cassandra and Rachel. If anything, maybe his “makeover” will be making over what his initial dreams were. That was the first time I’d seen Dungeons and Dragons played as a LARP (Live Action Role-playing game). 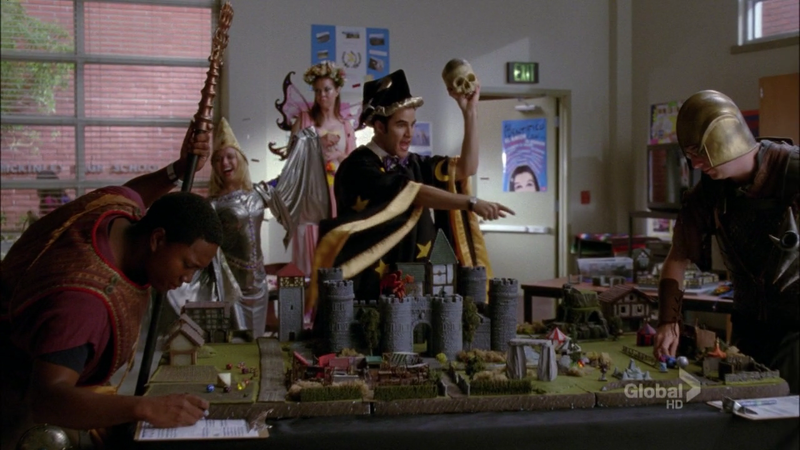 If I am remembering D&D right, Blaine was playing a wizard. Please, someone who played D&D more than the few times I did, correct me if I’m wrong about the wizard part. It would be Live Action Role-playing if done like that, though. Artie gave Brittany a thumbs-up when she said, “I’d like to know if anyone can prove that Blaine was actually born in this country.” I took that as Artie prompting Brittany to say that. I think Artie and Brittany shared the responsibility for that. That mix of racism and xenophobia is very much what has been going on in U.S. politics for years now. I don’t think it was accidental on the part of the writers that Brittany answered the favorite color question with “Filipino.” I don’t know if it was just meta or if there’s going to be something made of it within the show later in the season, but I’m curious. Artie didn’t think it was worth explaining to Brittany that that wasn’t what he’d meant. He changed the subject. Artie has let racism pass without saying anything at least twice this season already. Tina looked at Artie and expected him to say something to Kitty in “The New Rachel.” I wonder if it’s going to picked up again and used for Artie to learn a lesson, or if it will be dropped. Artie was quite happily xenophobic towards Rory when Artie was trying to get a date. Artie was xenophobic again in “Makeover” for the same reasons, and just like last time, he knew better. We got to see Blaine’s expression in reaction to what Brittany said. As with him letting racism slide, if Artie keeps it up, maybe he’ll get confronted on it. I didn’t take it as Brittany throwing the election. Could you explain that? I thought Sam stripping probably helped Blaine’s ticket. Blaine was established as one of the bros last season, and that’s continuing. I think there’s still a tension between what people think Blaine’s like and how Blaine really feels. It’s possible, but it also seemed to be part of a larger association of Brittany with the Republican Party–Artie being Cheney to Brittany’s Bush, Brittany telling Sam that she didn’t want their relationship to be ruined like that between Sarah Palin and her “grandfather”. I’m with neyronrose–can you explicate your reading of this? I just rewatched the episode and I really couldn’t see it. I took her speech to be kind of part and parcel of the attitude she’s had since she found out she wasn’t going to graduate last season–she doesn’t want to leave McKinley, ever. She doesn’t see her repeat of the year as a chance to do things differently, but really just as a chance to relive her last senior year all over again, complete with failing her classes and doing nothing as president, which would just perpetuate the cycle of her being stuck at McKinley. Which seems to be what she wants, thus her speech about *always* being in school, even on weekends and during the summer. She doesn’t want to leave, and she doesn’t understand why anyone else would want to. I didn’t really see her speech as being purposefully alienating, any moreso than her speech about tornadoes last season, which *won* her the election. It seemed pretty in line with what Artie told her was her strength, that she exists in “a magical other dimension where anything is possible”, and she seemed pretty earnest both about her speech and about her desire to win. 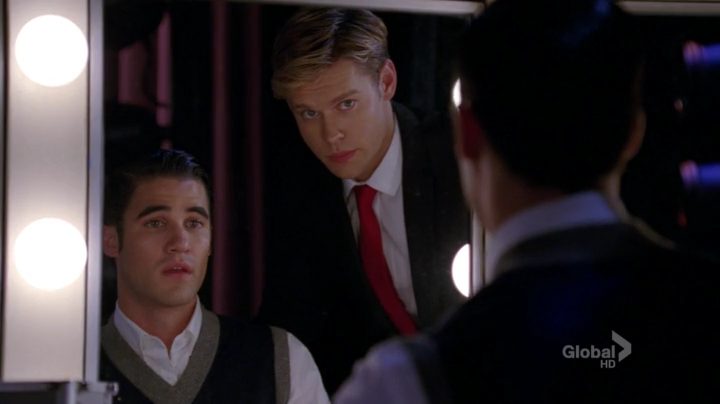 My reading of the debate was when Blaine went completely unhinged about the hair gel, Brittany decided to make amends. Because, yeah, she did do something awful to pick on Blaine last year. And she just saw it was still affecting him. Like, a LOT. He compared banning hair gel to genocide. Brittany’s no idiot. Not when it comes to feelings. Last year she campaigned successfully on a platform of sweets and boobies. She could have won this election if she wanted to. So yeah, I think the weekend-at-school platform was a throw to Blaine — and, in part, her realising that she actually has to move on this year instead of repeating her first senior year indefinitely. But I thought that when Sam confess s that he voted for Brittany, Brittany says she voted for herself because she really wanted to win. How does that mesh with this theory? That could well put a fork in it. That said, just because I want something, doesn’t mean I take it — especially if I think someone else deserves it. She already made her amends to Blaine about the hair gel thing *at prom*, though–she told him that she’d abused her power as president, and then gave him permission to wear hair gel. When Blaine went unhinged about hair gel during the speech, what Brittany did was explicitly call him a liar (instead of just saying “of course I wouldn’t”, which would be less accusatory towards Blaine) when he said she would probably start burning people. 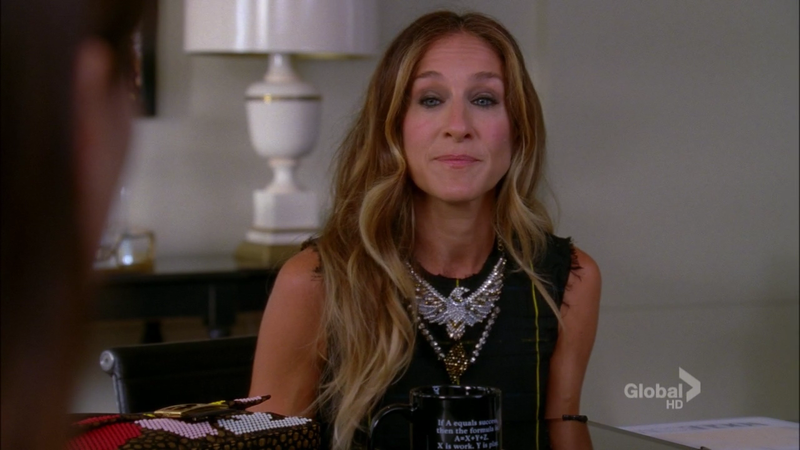 If she was actually trying to make amends to Blaine, she could have just pulled a Rachel. I think actually that Artie’s earlier comment to her, and possibly the earnestness of Blaine’s speech, inspired her to do something she thought would be good for the student body–staying in school all the time, just like she wants to, because she loves McKinley so much and she thinks everybody else should too. She *could* have won easily if she wanted to, by offering the student body what she knew they would want, but Artie told her earlier that the way she sees the world is her strength. I think she *was* actually attempting to do her senior year differently, but by waging an honest campaign instead of offering pixie sticks. Re: Blaine-as-wizard, I’m pretty sure that was just an homage to Darren Criss’ Harry Potter musical.